Vision Sciences Society is honored to present Melissa Le-Hoa Võ with the 2018 Young Investigator Award. The Young Investigator Award is an award given to an early stage researcher who has already made a significant contribution to our field. The award is sponsored by Elsevier, and the awardee is invited to submit a review paper to Vision Research highlighting this contribution. How do you recognize that little bump under the blanket as being your kid’s favorite stuffed animal? What no state-of-the-art deep neural network or sophisticated object recognition algorithm can do, is easily done by your toddler. This might seem trivial, however, the enormous efficiency of human visual cognition is actually not yet well understood. Visual perception is much more than meets the eye. While bottom-up features are of course an essential ingredient of visual perception, my work has mainly focused on the role of the “invisible” determinants of visual cognition, i.e. the rules and expectations that govern scene understanding. Objects in scenes — like words in sentences — are arranged according to a “grammar”, which allows us to immediately understand objects and scenes we have never seen before. Studying scene grammar therefore provides us with the fascinating opportunity to study the inner workings of our mind as it makes sense of the world and interacts with its complex surroundings. In this talk, I will highlight some recent projects from my lab in which we have tried to shed more light on the influence of scene grammar on visual search, object perception and memory, its developmental trajectories, as well as its role in the ad-hoc creation of scenes in virtual reality scenarios. For instance, we found that so-called “anchor objects” play a crucial role in guiding attention and anchoring predictions about other elements within a scene, thereby laying the groundwork for efficient visual processing. This opens up exciting new avenues for investigating the building blocks of our visual world that our Scene Grammar Lab is eager to pursue. Melissa Võ received her PhD from the Ludwig-Maximilians University in Munich in 2009. She then moved on to perform postdoctoral work, first with John Henderson at the University of Edinburgh, and then with Jeremy Wolfe at Harvard Medical School. Dr. Võ’s work has been supported by numerous grants and fellowships, including grants from the NIH and the German Research Council. 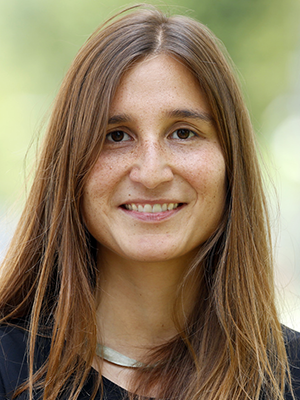 In 2014, Melissa Võ moved back to Germany where as freshly appointed Full Professor for Cognitive Psychology she set up the Scene Grammar Lab at the Goethe University Frankfurt. Dr. Võ is a superb scientist who has already had an extraordinary impact on our field. Her distinctive contribution has been to develop the concept of “scene grammar”, particularly scrutinizing the distinction between semantics and syntax in visual scenes. The distinction can be illustrated by considering scene components that are semantically incongruent (e.g. a printer in a kitchen) versus those that are syntactically incongruent (e.g. a cooking pot in a kitchen, floating in space rather than resting on a counter). Dr. Võ has used eye-tracking and EEG techniques in both children and adults to demonstrate that the brain processes semantic and syntactic visual information differentially, and has shown that scene grammar not only aids visual processing but also plays a key role in efficiently guiding search in real-world scenarios. Her work has implications in many areas, ranging from computer science to psychiatry. In addition to being a tremendously innovative and productive researcher, Dr. Võ is an active mentor of younger scientists and an award-winning teacher. Her outstanding contributions make her a highly worthy recipient of the 12th VSS Young Investigator Award.